Important Note: The Exchange 2010 Archive mailbox feature requires Exchange 2010 Enterprise CALs! Note: For archives that no longer link to an active mailbox, if these archives are still required then export to PST instead. 6) The migration from Exchange 2003 to Exchange 2010 is a straightforward Move Request from the Exchange 2010 EMC or EMS. 7) Final step would be configuring the Archive Mailboxes in Exchange 2010. 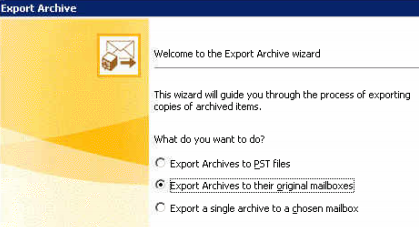 Note: Another option would be to just Export to PST all the mailboxes then re-import the PST, but re-injecting into Exchange is potentially quicker (only the re-inject operation and the Archive Policy will sort out the rest) and also avoids any compatibility issues with re-importing Exchange 2003 PSTs into Exchange 2010. 2) Re-injecting archives back into Exchange will potentially cause the Exchange 2003 mailbox database to start growing. Also, it will generate a lot of transaction logs. 3) Regards handling transaction logs, the preferred method is to take regular backups to keep the transaction logs down, if this is not an option then circular logging will need to be enabled on the Mailbox Store. 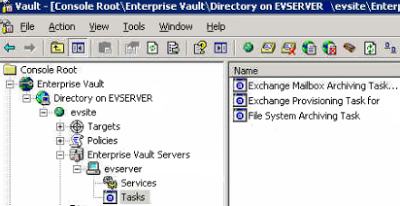 4) Migrating mailboxes to Exchange 2010 will generate transaction logs on the Exchange 2010 server – again recommend regular backups to keep the logs down. It is important to remember that when you move a mailbox from Exchange 2003 to Exchange 2010, the white space is only made available in the Exchange 2003 server database after the database maintenance task runs. 5) If the Exchange 2003 Standard 75GB database limit is too much of a problem, it can be upgraded to Exchange 2003 Enterprise!